Gas Hot Water Systems Sydney. The complete guide to gas hot water. When the time comes to buy a new gas hot water system, it’s usually because your old heater is broken (no hot water or flooded laundry?) or it no longer suits your household hot water usage requirements. In most cases, it’s an emergency and you need a new hot water system fast! A few days of cold showers strikes fear in most people (and we don’t blame you!). But, with so much choice on the market when it comes to the range and brands of gas hot water heaters, how do you know which one is best for your home and household requirements? While it’s easy to be swayed by a lower price and lose sight of the three factors that we believe matter most: QUALITY, EFFICIENCY and RELIABILITY. At Cheapa Hot Water Sydney, our hot water specialists go to great measures to ensure your new gas HWS offers quality, efficiency and reliability so you can relax in the knowledge you’ll have trouble-free hot water for many years to come. Even if your old HWS has adequately catered to your household hot water usage requirements, it shouldn’t be a matter of replacing it with the same make and model. We will most probably be able to suggest a better system that will save energy, reduce your bills and be kinder to the environment. Did you know that a typical household uses around 40-50 litres of hot water per person per day. A four-person household needs a gas hot water tank of about 135–170 litres. * Source – Sustainability Victoria. Will there be the need to fill a large bathtub or spa? Location of your property as climate and water pressure can determine what gas hot water system is best suited to your region. With over 20 years experience, our qualified hot water installers will suggest what gas HWS will best suit your requirements based on your household size and hot water usage requirements. Without expert advice you risk running out of hot water because you have chosen the wrong size tank or dread receiving your quarterly energy bill because your HWS is inefficient. Your gas hot water system is an investment for your future and the decision of which product to buy shouldn’t be made without reliable, expert advice. Call us today for an obligation free gas hot water advice on 1800 266 999. In Australia all gas HWS should come with a clearly labelled energy efficiency rating. The more stars, the more energy efficient. The highest rating is 6 stars. The graph below compares the annual running costs for various types of hot water systems for a range of households. 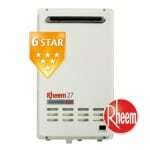 Compare gas hot water systems. Source: Sustainability Victoria. There are two main types of gas hot water systems: gas storage hot water heaters and continuous flow or instantaneous gas hot water systems. Gas storage systems deliver hot water instantly as they store a generous quantity of hot water ready for use in a storage tank. A good gas hot water system should be able to supply a strong flow of hot water and service multiple showers or hot water taps at once. While new gas hot water systems offer fast recovery and heat cold water quickly, when purchasing a new tank it’s very important to choose the right size that will adequately cater to your household hot water usage – summer and winter. Gas storage tanks are usually installed outdoors due to venting requirements. 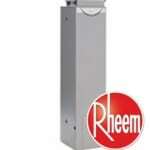 They can be installed inside with a flue. Some have a pilot light which uses a small amount of gas. Electric ignition is more economical but in a black out you lose your hot water supply. Stainless steel tanks, although often more expensive, last longer and don’t require as much maintenance as mild-steel tanks. Your local water quality may determine what system is best for you. We will advise you accordingly. While tanks are well insulated, over time there may be heat loss. We can advise a location for your tank to reduce heat loss. 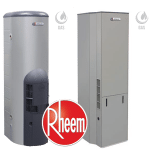 RHEEM GAS STORAGE HOT WATER HEATERS : We stock an enormous range of gas hot water storage tanks catering to the requirements of all household sizes and budgets. 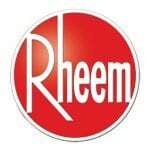 Rheem has been Australia’s premier water heating brand for over 75 years and is one of our most requested and popular products. 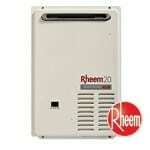 Below are examples of our most popular gas storage hot water heater products. Detailed specifications of other gas HWS are available anytime upon request. Instantaneous or continuous flow gas hot water systems heat the water as you need it, for as long as you need it, so you never run out. Instantaneous HWS work different to storage water heaters as they heat on demand instead of storing hot water in a tank. They are typically mounted to the wall and take up less space than storage gas HWS so are ideal for compact home sites and apartments. Some have a pilot light which uses a small amount of gas. Electric ignition is more economical but in a black out you lose your hot water supply. Heat only as much hot water as you need, when you need it. The water can take a few seconds to heat as it starts flowing through the pipes to the tap. The time taken will depend upon the pipe distance from the HWS to the tap. No heat loss as hot water is not stored in a tank. Typically cheaper to run that gas storage systems. Some low flow shower heads may not trigger the water heater to turn on. We happily and quickly rectify this problem for our customers. Some instantaneous HWS come with electronic temperature controllers which allow you to choose the exact temperature you need and guard against scalding. Ask us for advice. 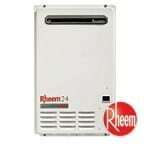 Some instantaneous gas systems are solar ready and can be upgraded without the need for special fittings. Ask us for advice. RHEEM INSTANTANEOUS GAS STORAGE HOT WATER SYSTEMS : We stock an enormous range of instantaneous gas hot water storage tanks catering to the requirements of all household sizes and budgets. 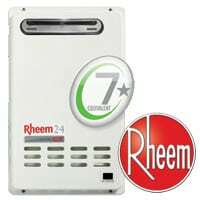 Rheem has been Australia’s premier water heating brand for over 75 years and is one of our most requested and popular products. 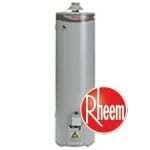 Below are examples of our most popular continuous flow gas storage hot water heater products. Detailed specifications of other gas HWS are available anytime upon request. We buy direct from the manufacturer and our enormous buying power means huge savings when you buy a new gas hot water system from us. Get a quote today! Call 1800 266 999. Our gas hot water systems are competitively priced because we purchase such large quantities each year direct from the manufacturers. A saving we can pass on to our customers! As a price guide, a quality gas hot water system will range in price from approximately $900 to $2000 (not including installation). We offer highly competitive gas hot water heater pricing – as one of Australia’s largest hot water system installers, we have enormous buying power with savings we can pass on to our customers. We’ll take away and recycle your old gas or electric hot water tank free of charge. We offer complete integration solutions for all your hot water requirements – gas, solar and electric. Friendly, helpful advice to ensure you purchase the right gas hot water system for your home or business. Our licensed hot water plumbers can install your new gas hot water system today. Did you know that by changing your old electric hot water tank to a more energy efficient gas hot water heater, you can save up to 80% on your household energy costs each year? GAS HOT WATER HEATER QUOTES : Call us today on 1800 266 999 for a competitive gas hot water system prices. Our specialist gas hot water installers make the process of switching to from electric to gas simple and fast. We discuss with you a suitable location for your new gas hot water system. We will inspect your property for available gas pipework. If not present, we lay new pipework from the street main supply to the location of your new gas HWS. We connect your new gas hot water heater. Once your new gas system is working, we disconnect the old electrical connection that is no longer needed. If required, we will take away and recycle your old electric hot water system. It is important to note that there are Government plumbing regulations determine where gas hot water heaters can and can’t be installed such as proximity to windows, doors, etc. Our licensed gas hot water system installers will ensure the position of your new HWS complies with Government standards. NO NATURAL GAS IN YOUR AREA? If natural gas is not available in your area, liquid petroleum gas (LPG) bottles are an alternative. Contact us for more information on 1800 266 999. We offer fast, same day gas HWS installs throughout Sydney and the Central Coast. Gas hot water heaters an expensive appliance and should only be installed by a fully qualified, licensed tradesperson and hot water plumber. We are authorised gas hot water system installers for the major brands including Rheem hot water, Dux, Rinnai, Aquamax, Bosch, Conergy, Hocking, Apricus, Vulcan, Everhot and more. Don’t risk voiding your warranty by using inexperienced, unlicensed labour. We can safely repair your gas system when under warranty and liaise direct with the manufacturer regarding any associated costs. If your hot water system is damaged in a storm, or any other unforeseen circumstance, we are happy to negotiate the repair through your insurance company. Did you know that a gas hot water heater installation needs plumbing, gas and electric components. This requires the experience and qualifications of both a licensed plumber and a licensed electrician. At Cheapa Hot Water Sydney, our licensed gas installers are qualified to undertake any plumbing and electrical work required to complete your gas hot water system installation quickly and within budget. Plumbers who do not specialise in gas water heater installations may need to outsource the electrical work required to another tradesperson, thereby holding up the process and adding extra expense due to additional call out fees charged by employing two tradespeople. 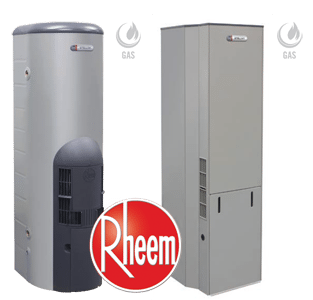 Our experienced hot water service technicians offer fast, same day gas HWS repair of all makes and models including Rheem hot water, Dux, Rinnai, Aquamax, Bosch, Conergy, Hocking, Apricus, Vulcan, Everhot and more. Our trucks are on the road right now stocked with thousands of spare parts to repair and service your gas hot water heater quickly. Hot water is our business so you won’t have to wait weeks for parts to be ordered and to arrive. Your gas hot water heater is a very expensive appliance so don’t risk voiding your warranty by trying to repair it yourself or employing the services of an unqualified, unlicensed tradesperson. ALWAYS check the qualifications of any tradesperson before allowing them to repair your hot water heater. It’s not worth the risk and can be an very expensive mistake if further problems arise with your hot water system. IS YOUR HOT WATER SYSTEM STILL UNDER WARRANTY? We are fully licensed to repair all solar, gas and electric hot water systems that are still under warranty. Gas hot water is our business! We are accredited service agents for all the gas, solar and electric hot water heater brands including Rheem, Dux, Rinnai, Aquamax, Bosch, Conergy, Hocking, Apricus, Vulcan, Edwards Solar, Solahart, Everhot and more. We offer free delivery of your new hot water system and complimentary disposal (and recycling) of your old water heater. Below are some recent gas hot water repair, replacement and installation we have completed recently around Sydney and the Central Coast. Below you will also find helpful gas HWS troubleshooting tips.